This walking tour takes you on an exploration of New Orleans voodoo. Learn about the pirates who helped found New Orleans and hid their treasure in and the surrounding area. Visit locations where paranormal activity, including documented ghost and vampire sightings, have been a common occurrence for centuries and continue today. 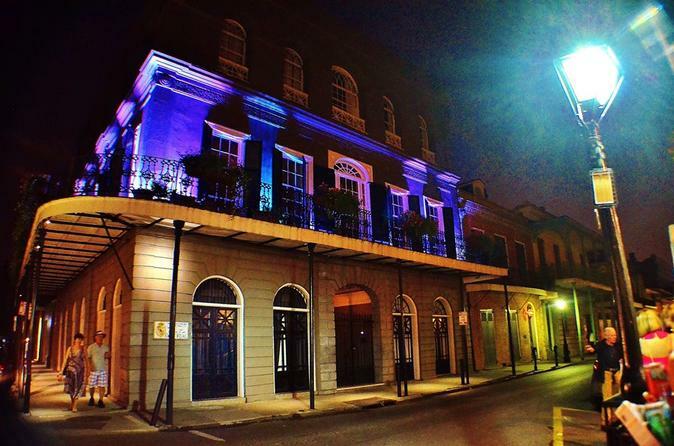 The tour guide will give background on the ghosts and vampires who are still roaming around the old, uneven and, yes, very dilapidated haunted streets of New Orleans, Louisiana. During this tour, an EMF meter, ghost/paranormal detector will be used. To add to the fun and entertainment of this tour guests will be allowed to stop in bars along the tour route and purchase a to go drink before the group heads out to the next location. Please keep in mind that some bars allow children inside however some do not. During this tour, visit St Anthony's Garden, behind the oldest operating church in the Unites States, the St Louis Cathedral. You will be surprised to hear all the tragic events that have happened at St Anthony's Garden. It was not always as peaceful as it is now. During this tour, you will learn about the famous Voodoo Queen Marie Laveau and the practice of voodoo. You will learn about the first vampires that came to New Orleans. Your guide will explain the events that brought the first vampires to New Orleans and the steps that were taken by a priest in the French Quarter in an attempt to stop the blood thirsty vampires from escaping nightly when darkness falls to protect locals and tourists. During this tour you will visit homes that belonged to a few of the vampires during the 1800s in one of the oldest neighborhoods in the United States. Visit multiple locations of unsolved murders and suicides. Hear the tragic New Orleans story of a girl who became known as the ‘Octoroon Mistress,’ whose ghost is often seen. You will be shocked when hearing the entire story behind this location. You will also experience the magical mystery that makes New Orleans so irresistible during this two hour (approx) tour.